After the Battle of Who-ville the Orks quickly overran this distant corner of the Goatronium Expansions, despite a desperate rearguard action by the few remaining Imperial Guard and Space Marine forces. Terrified Whos (both the tall and the small) fled the planet, carrying what jingtinglers and floofloovers they could before they were overrun by marauding bands of greenskins. Eventually the last human ship left. And with this victory, the Orks—being Orks—soon fell into squabbling among themselves. Most of this involved disputes over who was bigger and meaner, who looted what, whose head was squishier, or how many grots could fit in a bucket. However, when a powerful and mysterious alien artifact was discovered on the planet, skirmishes turned to serious slaughter as three rival warbands sought to possess the newly-found device. A mysterious alien artifact is discovered. The first of these, of course, were forces of mechanical mayhem commanded by Warboss Da Grinch and his loyal aide Maxxx. Their army had played a key role at the Battle of Who-ville, and—in Da Grinch’s view—this meant that pretty much everything on the planet now belonged to him (or ought to). The second group was led by renegade Orkish scientist Dr. Morork, whose unauthorized genetic and cybernetic experiments with grots had led to his being ostracized from polite Orkish society (whatever that might be). For Dr. Morork, alien technology was something he simply must have. While his mind had been downloaded into a Stompa after a near-death experience some years ago, his twisted cunning had become even more formidable. 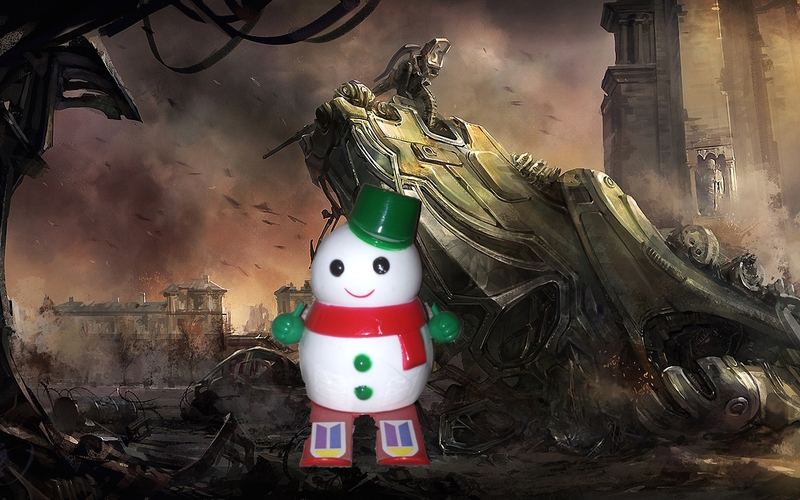 Finally, there were the Bahumbug Clan led by Warboss Scrooge. Notoriously miserly, Scrooge refused to pay up for trukks, battlewagons, or other forms of transport and pretty much made his boyz footslog everywhere they went. He had been elsewhere in the quadrant when news of the relic’s discovery had reached him. It seems as good a reason as any to declare a Waaagh. Rules: Warhammer 40K 6th edition, because Warboss Scrooge is far too cheap to buy the expensive new 7th edition given that it was issued a mere two years after its predecessor. The current Ork Codex will be used, however. Special Rules: Night Fighting (on 4+ game turn 1 is night), Reserves. Roll for areas of snow on battlefield when first in contact: 1-4 shallow snow (no effect on game play), 5-6 deep snow (difficult terrain).